The demands of snow-covered streets are no challenge for Yokohama's Guardex 721. 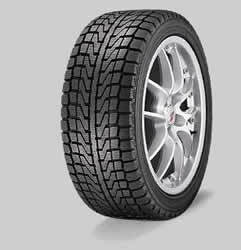 Its micro-bubble compound and serrated block edges deliver ultimate control and grip in tough weather, and its dual "N" shaped center block in conjunction with a unidirectional tread design make this tire teh master when snow and ice cover the pavement. Yokohama sets a new standard for snow tire performance with Guardex 721.